When I was younger, holidays meant visiting grandparents and family in northern Wisconsin, where evenings were filled with elaborate meals and gift exchanges. Opening a gift wasn’t as simple as tearing through a pile of presents, though. My grandma, always ready with a lesson in her back pocket, instructed me and my cousins to take a seat in the line of chairs in her living room. Once seated, she handed each of us a present. Starting with the oldest, we could open our gifts one at a time. She wanted us to enjoy opening our own present, and to also enjoy other’s opening their gifts, to experience the feelings of others until one day those feelings felt like our own. Only now as a grown-up can I fully understand the important lesson my grandma taught me. Thanks to her, few things fill me with more joy than being able to give a family member or friend a present, especially one that is handmade. That’s what’s so wonderful about the art of crochet. No matter how skilled you are, there’s always a pattern out there that’s right for you. And chances are, if you keep looking, you’ll find just the right one to make for everyone on your holiday shopping list. 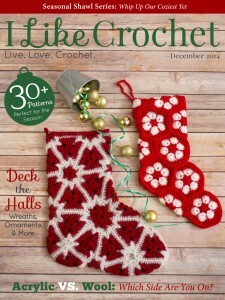 It’s with great excitement that I present this December issue to you, our loyal readers. From our collection of charming snowflake projects and festive ornaments to simple cowls, slippers and wearables, you’ll find everything you need to make this holiday season truly magical.